Successfully Added Outdoor Personal Panic Alarm - 120DB, 5 LEDs, IP55 Rating, Compass, 350mAh Battery to your Shopping Cart. This compact and lightweight personal panic alarm draws attention to any crisis. Suitable for women, men, children and the elderly this personal alarm comes with a strong back clip as well as eyelet so it can be attached to clothing or clipped to your keychain. This dual action alarm has bright flashing LEDs and a 120db piercing alarm that is sure to draw the attention of everyone around. It’s also ideal for walking, running, hiking or travel and the LED lights can be activated in 3 modes that will keep you visible on the roads when walking at night. When activated via the panic button the 120db alarm will sound for 30 seconds and the 5 LED lights will flash to make you instantly visible. 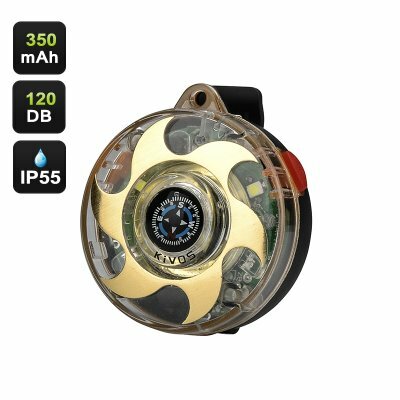 The alarm has an IP55 waterproof rating and a built in 350mAh battery that will last between 2 and 3 hours if continuously sounding the alarm. The addition of a built in compass brings extra benefits when you’re out trekking as it can provide a helpful backup for navigating as well be you call for assistance should you need. This personal panic alarm comes with a 12 months warranty. Brought to you by the leader in electronic devices as well as wholesale gadgets, Chinavasion..